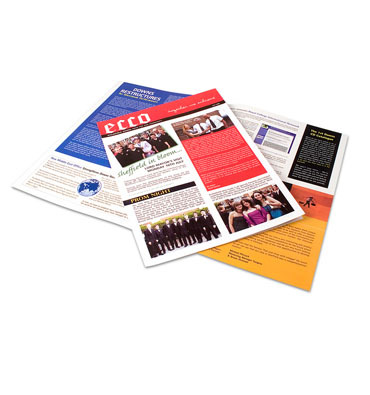 Vibrant and attractive page layout, a professional masthead, bold section headings, coupled with well written articles and a good mix of photography and graphics keep employees and recipients up to speed with recent events. Care must be taken to ensure that complete copy and images are provided to us well before the issue deadline to guarantee that proofs can be read and checked before printing takes place. Popular with larger companies, local government and educational establishments where the need to inform their staff and customers/students is an important obligation, a good Newsletter can be morale boosting and dynamic.